The Chosen One You’re Having a Laugh! What a difference a year makes. It doesn’t seem that long ago on when on the night of April 22nd 2013, Aston Villa away supporters had to suffer the indignation of watching Manchester United celebrate their 20th title win after a hat-trick of offside Robin Van Persie goals gave United a 3-0 win. There was some solace in taking the mick out the United kid with the framed Van Persie picture, but this season’s visit offers a chance for a little bit of payback. The inept performance of Moyes’ United team led to a certain faction of United fans to finally turn on the United boss. 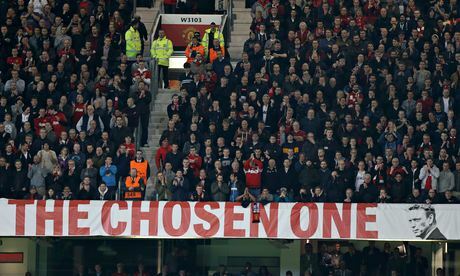 ‘The Chosen One’ banner that honours Sir Alex Ferguson’s role in choosing his successor and also acts as a wink to Chelsea’s ‘Special One’ moniker of Mourinho, needed steward protection as United fans sought to remove it from the stand at the Manchester derby. Ferguson, in the director’s box for the game, also received the wrath of United fans during the team’s lacklustre performance. Saturday’s televised game between Villa and United offers Villa supporters a great chance to join in the fun with the chant of ‘The Chosen One – you’re having a laugh!’ an obvious choice for a bit of terrace banter. The next step is to think up a chant to take the mick out the proposed ‘The ‘Wrong One – Moyes Out’ plane banner United fans have forked out £840 in 24 hours to pay for, which is planned to do a fly-over during the game. The popular United fan site Republik of Mancunia, who organised it, have divided opinion amongst the United faithful with their proposed plan of action. Certainly, Villans can understand that with Lambert also divided fans at the moment, but the plane gesture seems a little drastic at this stage with United at least still in the Champions League quarter-finals. If Moyes managed somehow to win the tournament, there would be a certain amount of egg on faces. Certainly when MOMS took out our ‘We Told Your So’ advert in the Birmingham Mail, it was timed at the end of the season, until the club and newspaper in their meddling made a pig’s ear of it, and as a result, it ran before the last home game (and they could have few complaints about that, considering the players nightclub brawl story broke at the same time) . That supporter message was also a no-brainer and a much larger percentage of Villa fans were understandably behind the sentiment of it. Back to the Moyes message, I’d normally suggest shooting the plane down just for an away day laugh, but my dad’s a United fan and judging by the amount of anti-Moyes text messages he sends me (on a daily basis! ), there’s a chance he might be actually flying the plane. Surely we are missing a trick here? If it only costs £840 to hire the plane, should we not be offering to put up the money as they will need it to pay for increased ticket prices next year? I am told that they have been informed that season tickets will include compulsory cup games and if they qualify for the Europa league, they have to pay champion’s league prices. They have an even bigger debt than us. So if the poor things are going to have to fork out next year, surely their poor relations in Birmingham should at least twist the knife in the wound and offer to pay for the plane demo? I will chip in £5 to start it off. Haha. I think now football fans know it’s only £840 to hire a plane to fly a message over Old Trafford, they’ll be quite a few flying over there the rest of the season. Cheers. I still remember City fan’s ‘Good luck to Aston Villa from the city of Manchester’ banner at Villa Park back in 1993, when we challenging United for the first Premier League title. Still not happy, we bottled that! Hopefully we can take something off them on Saturday.